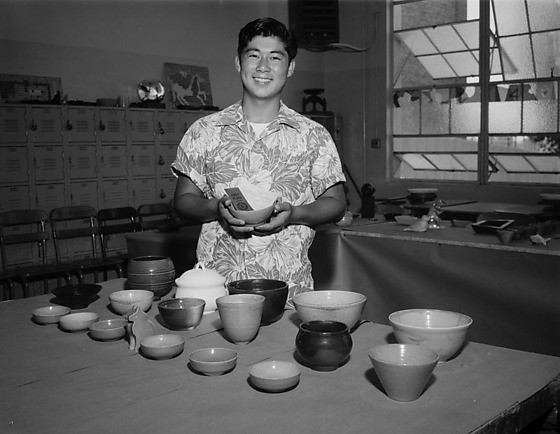 Smiling young man in an aloha shirt over a white shirt holds a bowl with first place ribbon at Belmont High School ceramic exhibition in Los Angeles, California, June 17, 1958. 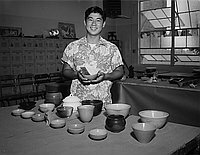 Eighteen ceramic pieces sit on table in foreground. Additional works on table in background near tables under open windows, right. Chairs and lockers at left. Typed on original negative envelope: Belmont High Ceremic Exhibit.